During a separate hearing, Judge Jeff McElroy separately dismissed some of the charges against fellow defendants, Siraj Ibn Wahhaj and Jany Leveille. Judge Emilio Chavez ruled that he could not keep the three in custody because prosecutors missed a 10-day deadline for a court hearing to establish probable cause for the neglect charges. Prosecutors have other options for pursuing charges against the three — Lucas Morton, Subhannah Wahhaj and Hujrah Wahhaj. That could include refiling the charges or asking a grand jury to indict them. Prosecutors had pressed to keep them behind bars and planned to present new evidence of an anti-government plot and talk of jihad and martyrdom among some members of the extended Muslim family that settled at the compound last winter. Defense attorneys say their clients have no record of criminal convictions and pose no risk to the public. Authorities are pushing ahead with other charges against the dead boy’s father, Siraj Ibn Wahhaj, and his partner, Jany Leveille. They were due in court Wednesday on charges of child abuse resulting in death, which could carry life sentences in connection with the death of Abdul-ghani Wahhaj. 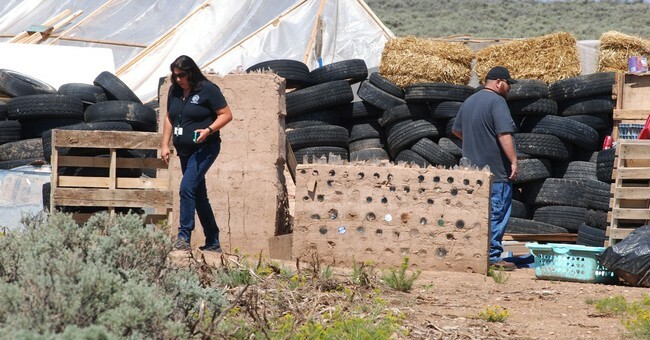 The severely disabled boy’s badly decomposed remains were found this month inside a tunnel at the high-desert compound near the Colorado state line. UPDATE: Charges dismissed against all five defendants due to 10-day rule regarding presenting evidence during preliminary hearings. Judge torched the district attorneys office for their incompetence, wonders if the office is overworked. #Breaking: Judge dismisses all charges against Lucas Morton, Subhannah Wahhaj and Hujrah Wahhaj. Three of five suspects in #TaosCompound case. He says this order for dismissal will be filed at 2pm after 1pm appeal of no-bond decision. Judge notes that state can re-file charges based on new information at a later time, but he does not have much choice to dismiss charges today, citing violating the 10 day rule. Back in court, as I understand, motion will be heard to dismiss charges against Siraj Wahhaj and Jany Leveille. These two are charged with child abuse resulting in death of Abdul-Ghani (Wahhaj’s son) who was found buried on the #TaosCompound. All rise. New judge and Siraj and Jany are in the courtroom. Judge starts by saying he has vacated other three no-bond appeals because they have been dismissed. That was Morton and Wahhaj sisters. Woa. Judge Backus has recused herself which is why Judge McElroy will be hearing these motions. I don’t know, but, Judge Backus’ recusal is probably not because of death threats and more likely because she was the judge who ruled on denying the no-bond motion in the first place. Just speculating. Defense for Siraj is up and making the same arguments. Siraj does have an extradition warrant from Georgia. His defense is saying that doesn’t matter, he’s still entitled to preliminary hearing in 10 days. Interesting caveat, the more severe charges were brought against Siraj and Jany were more recent. Meaning, the 10 day limit would be ending in September. Defense says that shouldn’t matter. Again, prosecutors didn’t know if they’d be on, “a 10 day track, or a 60 day track.” Reminder, if suspects are not in custody prosecutors have 60 days for preliminary hearing. State thought suspects were getting out. They couldn’t meet terms of release and have been in custody. Prosecutor says it wasn’t the state of New Mexico holding these two. Siraj’s GA warrant and ICE was holding Jany kept them in custody. Question here is when did the 10-day clock start ticking? That’s what state and defense are arguing now. Judge is up. He says these two cases are different, however it doesnt change the 10 day rule for a preliminary hearing. Judge is “upholding law of the state,” says DA office failed. #Breaking judge dismisses charges against Siraj Wahhaj and Jany Leveille. All 5 of the #TaosCompound suspects are free. Judge McElroy is hammering the DA office. He says he doesn’t know if the office is overworked or what, but he finds it disturbing the state didn’t play by the rules. Notes the DA is not present here.